The authoritative new reference guide that equips counselors, pastors and church leaders, and caregivers for an effective ministry of soul care. 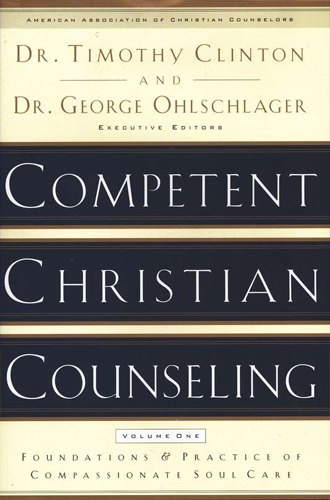 Under the guidance of the highly respected American Association of Christian Counselors (AACC), more than 40 leading Christian professionals have come together to provide this comprehensive, authoritative, and up-to-date reference guide for professional and lay counselors, pastors, and leaders in training. • a practical, 21st century model of Christian counseling that is not only “counselor friendly,” but also facilitates effective, biblical client change--all geared to help people mature in the ways and wisdom of Jesus Christ. 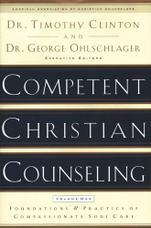 Competent Christian Counseling, edited by Timothy Clinton and George Ohlschlager, is destined to be regarded for years to come as the authoritative, trustworthy resource for Christian counseling.